Can I trust God when my child is seriously ill? Wessel Bentley knows the agony of this question, and he writes from his own experience of having a child with severe heart problems. Bentley understands parents' need for spiritual support when they face the tough task of raising a child with a serious illness. He sensitively guides parents through a 28-day process of prayer, reflection, and practical suggestions for coping with their situation. Week 1: How Can This Be? Week 2: Who Can I Blame? Week 3: What Can We Do? Week 4: How Can We Live? Each daily reading supports the weekly theme with a scripture passage, meditation, prayer, and suggestions for deeper thought or practical application. Reflection questions at the back of the book may be used for small-group discussion or further individual exploration. 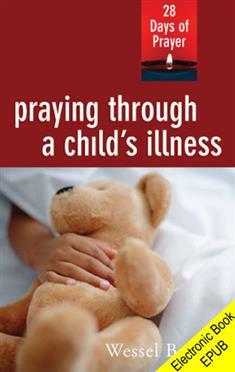 Praying Through a Child's Illness is a must read for every family dealing with a seriously ill child. Bentley's sensitive reflections will help sustain you through your time of intense difficulty.